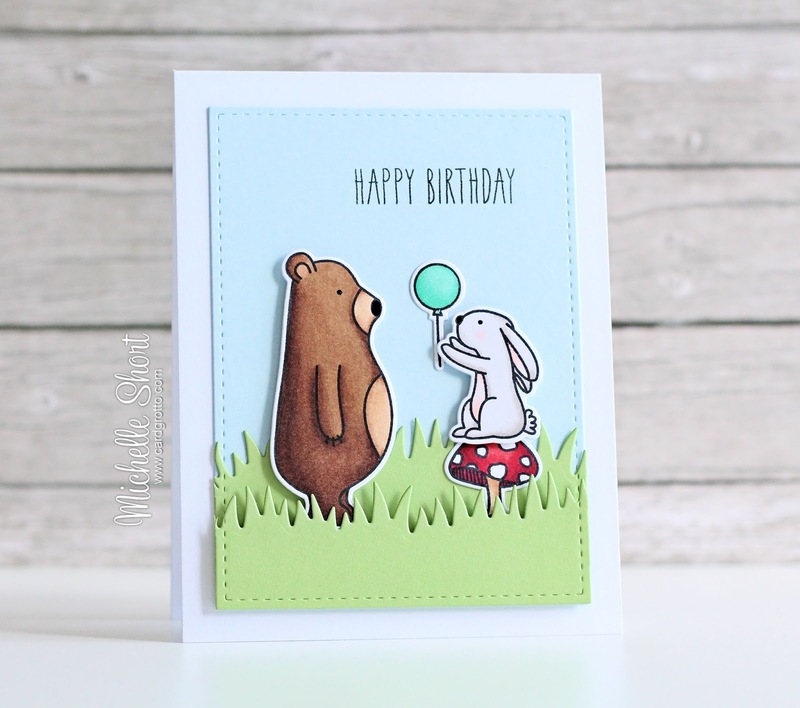 Hello there, today I am back to share a card that I have made for my good friend Sarah. If you see this, happy birthday hun, I hope you have a great day! I thought the Mama Elephant Woodland Gifts set would be a great to use for her card. It is so cute! 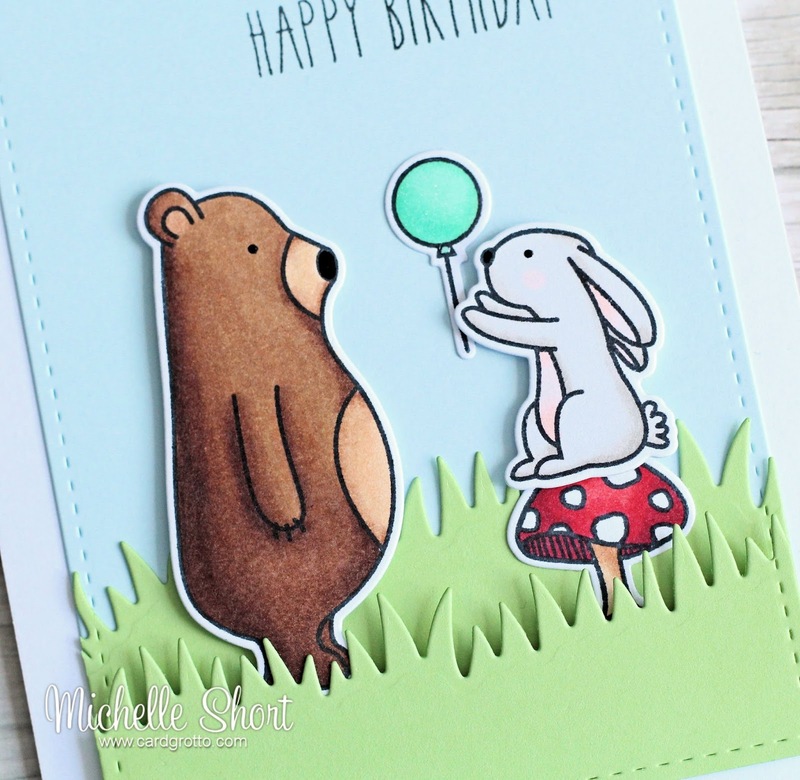 I started off by stamping and colouring the cute critters, toadstool and balloons from the set on to white cardstock, using black ink. These were then coloured using Copic Markers, adding black pen to the eyes and noses. I cut these out using the matching dies. 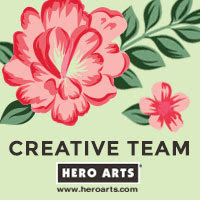 I then took the ME Femme Frames die and cut this from blue cardstock, as well as green. With the green piece, I ran this through twice more using the new ME Grassy Trio dies. These were layered up to make a little scene. The sentiment, from the same set, was stamped on to the blue piece with black ink. I then took the critters and popped these in between the grass. I used foam tape for the bear and bunny and regular tape runner for the toadstool and balloon. I also added clear Wink of Stella to the balloon as well as a coat of Glossy Accents. For the inside, I cut another layer of white cardstock using the Femme Frames die, as well as another piece of grass. 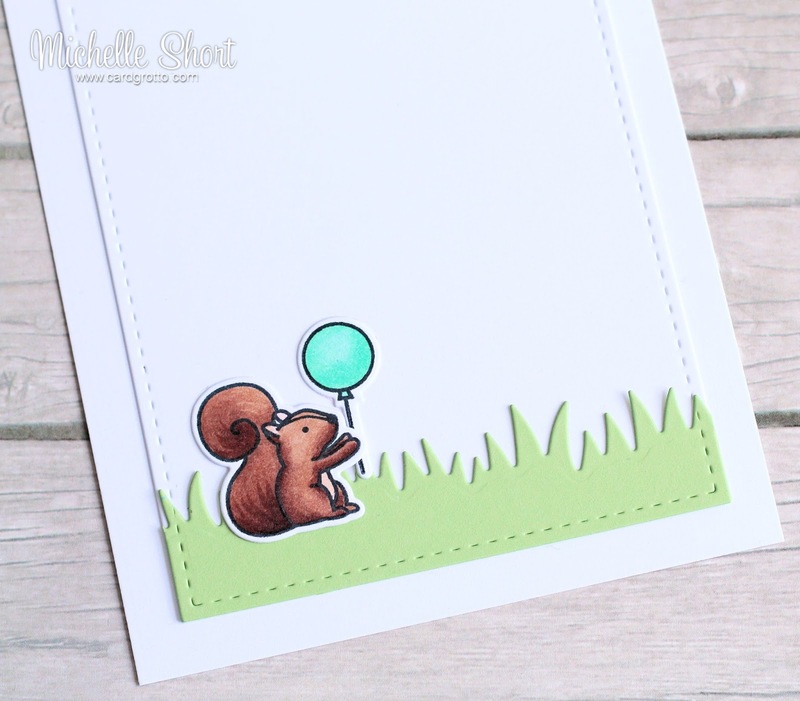 I added the cute little squirrel and balloon on top with tape runner. COPIC MARKERS: Bear - E59, E57, E55, E53, E23. Bunny - W3, W1, W0, R01, R00. Squirrel - E29, E27, E25, E23, E21, R00. Toadstool - E33, E31. R59, R46, R37, R29, R27. Balloon - BG34, BG23, BG13, BG11. Thank you so much for visiting me today. I hope you all have a lovely day! 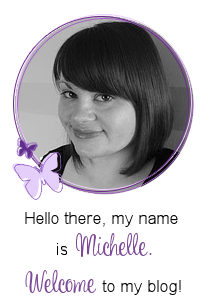 Michelle you have done it again, you have totally nailed it with this beautiful creation. I imagine your friend will love it..
What a fun card. I love that you finished off the inside as well.